Certificate programs dedicated to advancing your online teaching skills. The Online Teaching and Advanced Online Teaching Certificates draw on the latest information and research regarding methods, tools, and best practices for teaching in an online or digital environment. Not sure which one to choose? View the comparison chart to help you decide. Leverage your background and proficiencies as an educator, administrator, or institutional leader to become a more effective online/digital teaching & learning professional. 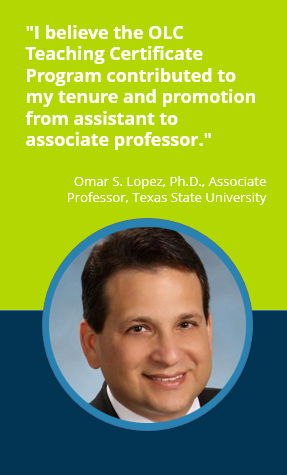 The OLC Online Teaching Certificate Program is offered as a sequence of one foundation course and three electives leading from the conceptual to the implementation of online learning effectiveness best practices. At the end of this program, you will be prepared to design and develop a complete online or blended course based on current research and best practices. Learn more and register for the Online Teaching Certificate Program. Save with Online Teaching Certificate Pass. The OLC Advanced Online Teaching Certificate Program is a 12-week workshop designed to help educators fine-tune existing online courses and degree programs in order to have a positive impact on student learning. The program is intended for those online faculty who wish to improve their online courses through the inclusion of active learning strategies, multimedia, and social media components, and stronger assessment practices. Learn more and register for the Advanced Online Teaching Certificate Program.